Kerry Cook was in Ottawa November 30 in the interests of saving the economy of Williams Lake – without hurting the environment. Cook has been mayor of Williams Lake in central British Columbia since 2008. She was part of a delegation of municipal, provincial and federal politicians – and others – interested in saving the endangered economy of that part of British Columbia. A Christian public servant had e-mailed me to talk about Cook’s visit. She encouraged me to meet Cook and talk. The subject of this discussion, my contact suggested, would be the mayor’s Christian faith and her advocacy for the economic survival of her community. Williams Lake and that whole central part of British Columbia has been hit hard by global economic storms recently. The vital mining and forest industries have both suffered. But there was hope. Taseko Mines’ Prosperity gold mine, about 100 kilometres from the city of 11,000, had been seen as a significant boost to the economy. The company had already invested $100 million in its preparatory and startup costs. The provincial government had approved the project, but, days before he resigned as federal environment minister, Jim Prentice announced that the feds would not okay the proposal – at least in its present form. To put it succinctly, draining one lake and using another for tailings disposal would not be in the cards. Many First Nations leaders in the area were opposed to the idea, as well. The fact that the two lakes would be restored and restocked at the end of the project did not cut the mustard, as they say. For Cook and her fellow municipal and regional district politicians, the “no” coming for an environmental reason could not be the end of the story. They wanted to restore the community’s hope by presenting the message that a careful reworking of the proposal could take care of the environmental concerns. I talked with Cook a few hours after she and the others in the delegation had met with several federal cabinet ministers, including Prentice’s replacement, John Baird. She made clear that representatives of Taseko were not part of the delegation. The reason seemed self-evident: The news of the federal decision about the Prosperity mine had allegedly been leaked in a way that affected the firm’s stock price. “We wanted to stay as far as possible from that issue, and to focus rather on the social and economic impact on the community coming out of the federal decision,” Cook said. A successful mine would provide in the order of 800 jobs during a two to three year construction period and about 500 more during the 30-year cycle of the mine itself. The multiplier effect involving about 3,000 jobs would mean much to the city and its surrounding region, which has a population totalling around 40,000. A long time business technology teacher and administrator at what is now Thompson Rivers University, Cook had a deep desire to see her community grow and develop socially, economically and – yes – spiritually. Others who know her are aware that she has worked diligently in all those areas. As she pursues the faith side of what she is doing, Cook draws resources from both the Transformations and Alpha movements. Transformations is a movement that has considerable acceptance globally among evangelical and charismatic Christians. It emphasizes the idea that if seriously committed Christians give themselves to both prayerful and practical leadership, the communities in which they operate can be transformed beneficially. Cook tries, with wisdom, discernment and diplomacy, to provide that kind of leadership, and she encourages other Williams Lake Christians in the same direction. Alpha is a British-originated basic Bible study and dinner activity which is credited with bringing a few million people globally to faith. Cook tries, at least yearly, to teach an Alpha course to people who have become intrigued with her own faith journey. Here in Ottawa, we are sometimes cut off from the reality of what is happening in cities and regions across Canada – both economically and spiritually. Listening to Kerry Cook provided an opportunity, for this journalist at least, to hear a story that otherwise might have been missed. 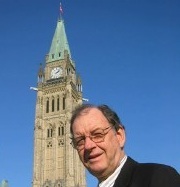 Lloyd Mackey is a member of the Canadian Parliamentary Press Gallery in Ottawa and author of Stephen Harper: The Case for Collaborative Governance(ECW Press, 2006), More Faithful Than We Think: Stories and Insights on Canadian Leaders Doing Politics Christianly (BayRidge Books, 2005) and Like Father, Like Son: Ernest Manning and Preston Manning (ECW Press, 1997). Lloyd can be reached at lmackey@canadianchristianity.com.